As I posted last week, I got a KitchenAid stand mixer for my birthday! I was working like crazy to finish my dissertation and didn’t really have time to play with it until this weekend. I decided to using the kneading tool and attempt to make bread. I had never made yeast bread by myself. The last time I “made” any type of yeast bread, I think I was in second grade and “helping” my great-grandmother. Spending that whole day baking is one of the best memories I have of her. 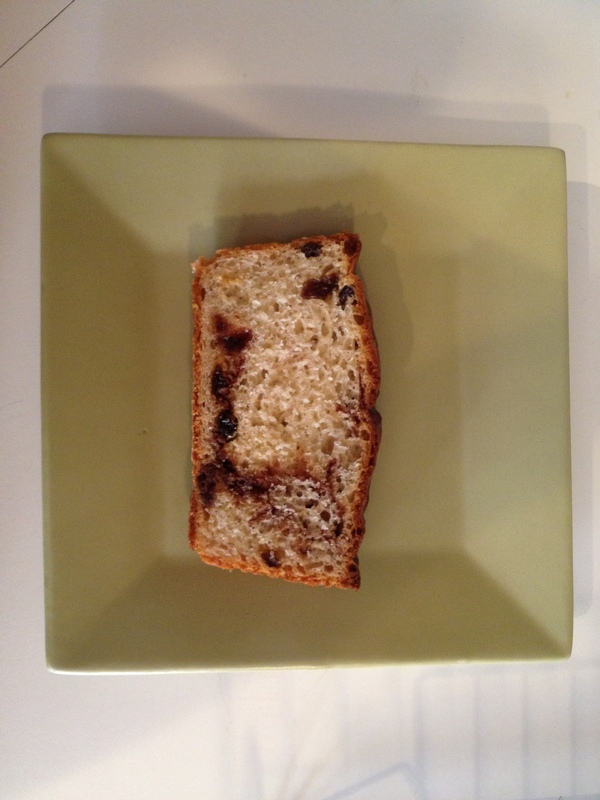 I’ve been slightly addicted to the Sun-Maid raisin bread lately, so I decided to try to find a homemade version online. 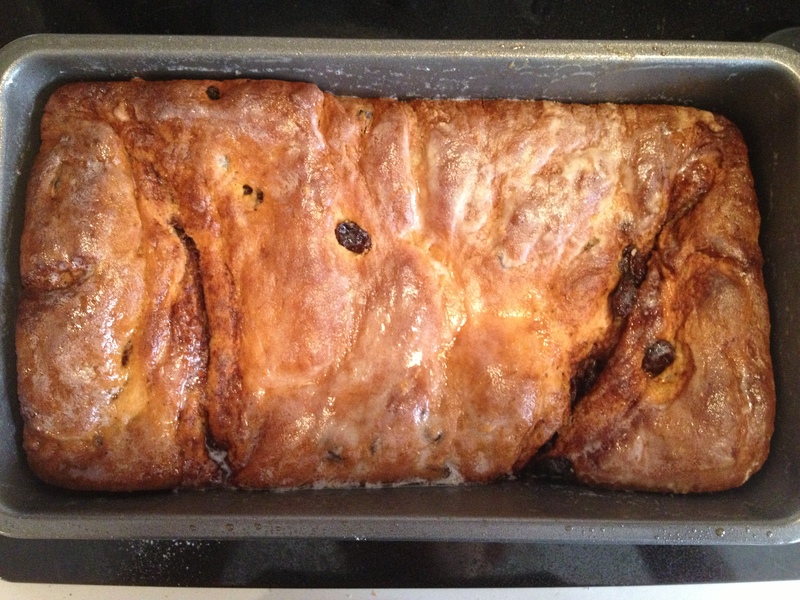 A quick Google search led me to a recipe titled “World’s Best Cinnamon Raisin Bread.” That sounded promising. Since I am not an experienced bread maker, I left the bread part of the recipe mostly alone, but I played with the filling that creates the cinnamon swirl. 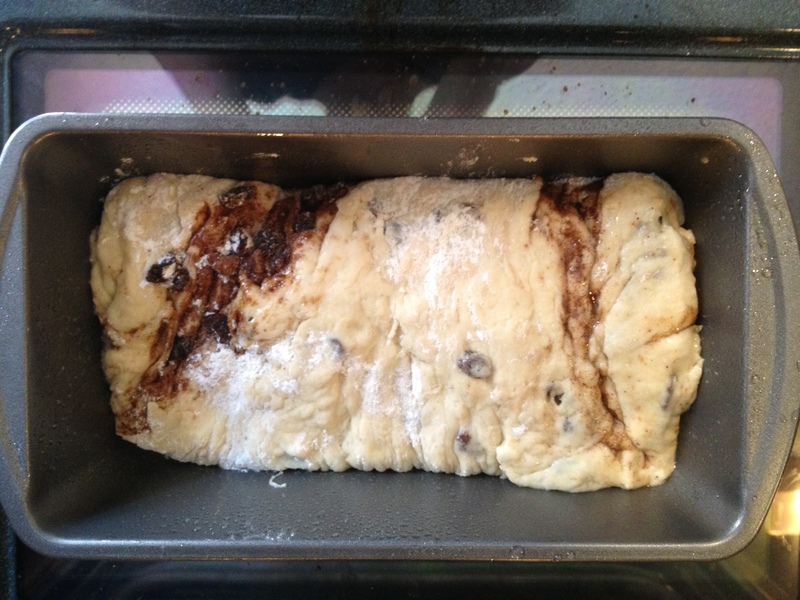 I really felt like the bread needed some brown sugar and more raisins. The bread turned out delicious. I had one mishap in the baking process. Several of the reviewers said that they used less flour than was specified to create a slightly sticky dough that made the bread more moist in the end. I put all of recommended flour in and my dough was still quite sticky. The sticky dough was OK until the point that I needed to roll the dough into a cylinder. It was very difficult to roll. My roll wasn’t symmetric, so my loaf ended up asymmetric. I would suggest adding more flour initially, so I added some flour in the recipe below. Warm 1/2 cup of milk in a small saucepan until it starts to bubble, stirring occasionally. Remove from heat. Let cool until approximately 120 F.
Dissolve yeast in warm water. Set aside until yeast is frothy, about 10 minutes. 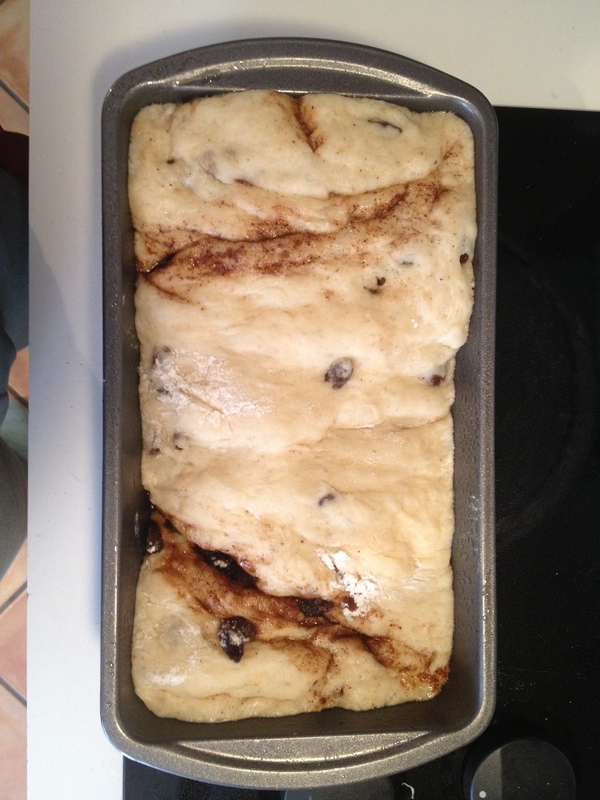 Mix together yeast/water mixture, 1/4 cup white sugar, egg, salt, 1/4 cup softened butter, 1/3 cup of raisins. Melt 1 tablespoon of butter and coat the bottom of a large mixing bowl. 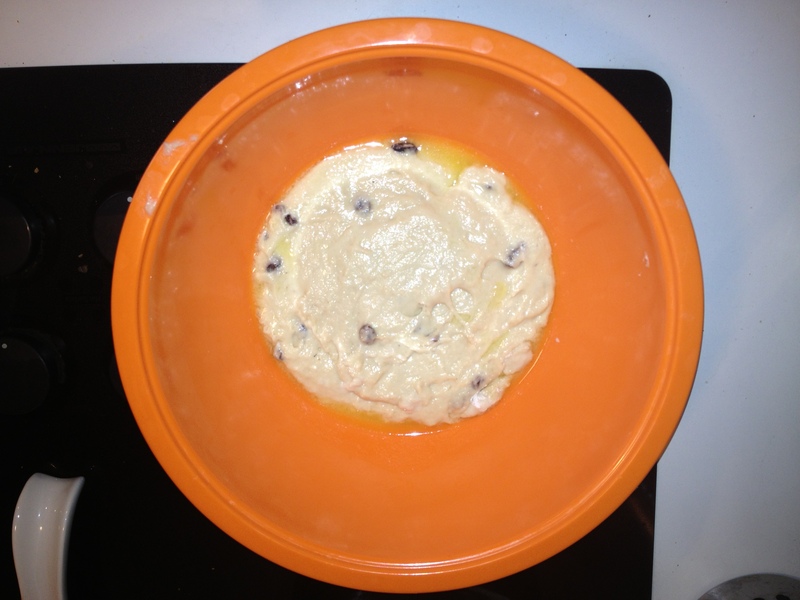 Place the dough inside the bowl. Tilt the bowl so that the access butter coats the dough. Put a warm, damp cloth over the bowl and place in oven with the light on. 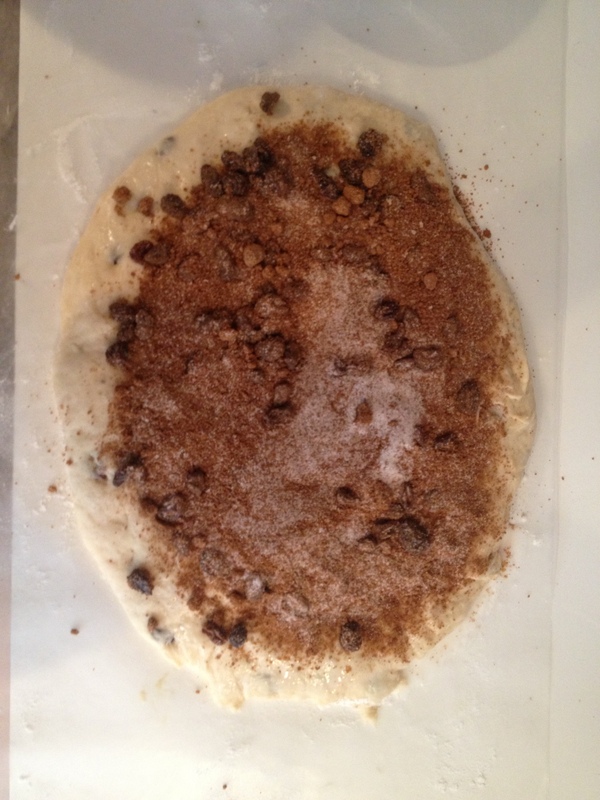 Allow to rise until the dough doubles in size (about one hour). Roll the dough to 1/2 inch thickness on lightly floured surface. Moisten the dough with about 1 tablespoon of milk using your hands. Mix the 1/4 cup white sugar, brown sugar, cinnamon, and 1/4 cup raisins in a small bowl. Sprinkle over rolled dough. Grease a 9 in by 5 in loaf pan with 1/2 tablespoon of melted butter. Roll the dough tightly. Pinch ends together. 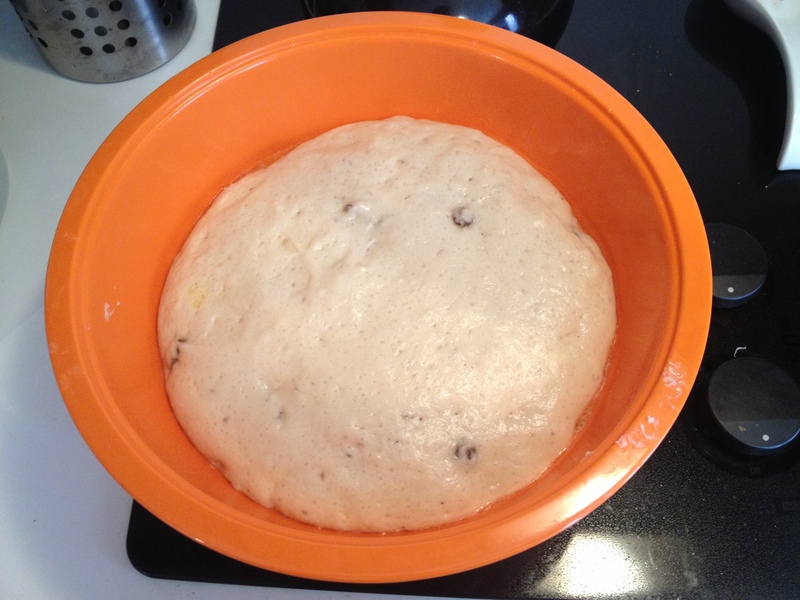 Place dough in loaf pan. Coat the top of the dough with 1/2 tablespoon of melted butter. Let rise uncovered in oven with light on for one hour. Bake at 350 F for 45 minutes or loaves are lightly browned and sound hollow when tapped. Remove from oven. Pour 1 tablespoon of melted butter on top of loaf. Allow to cool for 20 minutes in pan. After 20 minutes put loaf on wire rack. I must try this. My youngest son loves cinnamon. Thanks for the recipe. Rachel…enjoying looking at your healthy recipes. I am trying to watch my sugar intake as last Dr visit my sugar reading was 119. Dr. said to watch carefully my carb intake. Hard to exercise with my low back problems. Plus I have a heel spur, so much walking brings the pain. So need to make healthy meals for sure. I’m glad you are enjoying the recipes! Click on the 21 Day Fix Recipes for the healthy ones. A few of them were before I started eating healthy. I’m sorry to hear that your sugar readings are high. You are welcome to join any of my free challenges for more recipes! I have a couple more I need to post on the blog.